I went downstairs to discover a bird deftly stealing the dog's food while the dog slept just a moment away. We departed Eldoret on the westward road to Busia, a town split by the border between Kenya and Uganda. Unlike Nairobi, in which I didn't see a single bicycle (odd, considering the traffic congestion and the number of pedestrians), bicycles were everywhere in Eldoret. We noticed that many of the bicycles had an extra (sometimes fancily decorated) seat on the back. These were bicycle taxis (bodaboda); we'd often see one or two extra riders piled on the back seat. It's typical to see someone on a bicycle carrying a great big sack of produce to market, weaving among pedestrians and cars. Along the way, we passed a field full of cranes. We also passed some of these square dirt structures. Right next to the dirt huts was a rather fancy-looking mosque. I've gotten the impression that most people are Catholic here — scattered all over the countryside are small square buildings or corrugated-tin rooms labelled as churches of some kind, and bible verses are commonly cited or quoted on shop doors and walls. But every once in a while, there's evidence of a Muslim community as well. This is typical of truck exhaust. Cough, cough! We passed a truck carrying a load of sugar cane. The road ran west to Malaba and then southwest to Eldoret. Malaba is also on the border between Kenya and Uganda. This is the view from Malaba. In the distance is a bit of Uganda. This is what shops look like in Malaba. We passed some of these huts that people live in. Occasionally we would pass a building painted to advertise WaterGuard, a water chlorination product. 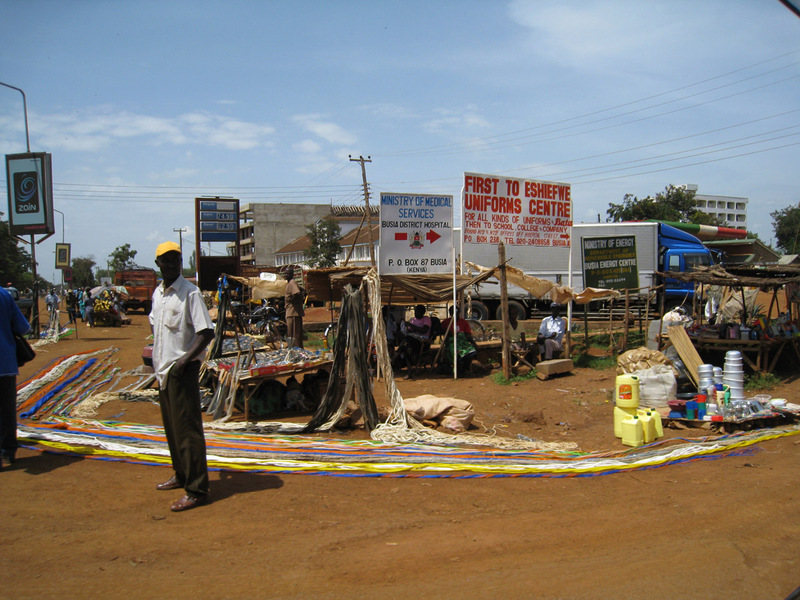 This is a street corner in Busia. This is the Blue York Hotel, where we stayed in Busia.